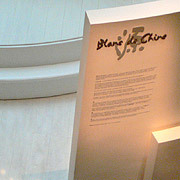 Blanc de Chine is a French term for the 18th century fine white porcelain prized in Europe for its exquisite quality. It’s this quality to which the brand aspires in its pursuit of global excellence, while being synonymous with style and superb quality. For their launch, they needed an exhibition that would embody these simple yet elusive values.